The results shown here and throughout the website are based upon the official results published by the organisers almost a month after the event. There were many errors and omissions in the final published results, most strikingly a 29 minute error in Dunkerton's final score but there were many other such errors! For example, the Loader/Hill/Neale Lancer which finished 7th has no scores for Division T, and were orginally classified 8th behind Herrmann, but after the event their score was reduced by 17 minutes. The addition of stage scores even for the 13 cars that visited all controls is often incorrect, and for those that did not visit all controls, there are many instances where the number of missed controls is not tallied correctly. I have generally shown the results as published but have tried to show the corrections where possible. In a few cases the errors are obvious typos and I have corrected these but in other cases it is difficult to discern whether the error is in the orginal stage times or in the summation. I have focussed greatest attention on the results of the 13 cars that completed the entire route and have not tried to resolve discrepencies in the actual total times of cars that missed stages. Beside, this was always a pointless exercise that sought to compare apples with oranges (unless they happened to miss exactly the same controls, which didn't happen!). This was before we had computers and spreadsheets to tally scores and it is remarkably difficult to add up hours, minutes and seconds, especially for well over 100 cars across 134 stages! However, given that the results were published almost a month after the event one might have expected the organisers to have done a few rudimentary checks at least on the first 13 cars, but in fact much of the results read like complete fiction! These errors are seperate from the timing and clock errors within the event, which in many cases were down to clock readings errors by individual officials, or more likely, to misread figures on road cards. Again, there appears to have been no attempt to resolve some odd scores by reference to control cards or road position. Some examples spring to mind, the first being the clean sheet by the Davis 180B on Stage W10 despite the fact that they were passed by another car that dropped 8 minutes (the difference would certainly have reversed their outright position with Watson/Harrowfield). Another example was Portman's 22.03 loss on the Brisbane Special Stage despite the fact that he was not passed by anyone and maintained road position, clearly impossible, so it was probably 2.03 instead. Late in the event the Loader/Hill/Neale Lancer was supposedly 8 minutes slower than the car following them 2 minutes behind yet they were not passed! There were no doubt many other such discrepencies. The remaining 79 finishers were classified according to the number of major controls missed. There are numerous counting errors in the results so what is shown below is based on the actual controls designated in the results as missed. Where this doesn't match the tally in the results, this is noted. There is no attempt to seperate those who missed the same number of controls because it is like comparing apples and oranges! 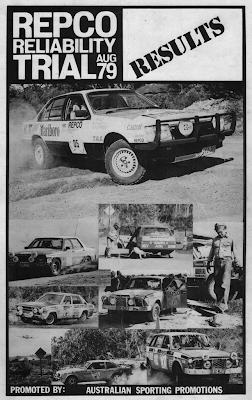 Great to have a site to commemorate the toughest-ever Australian motoring trial. Forgive me for being picky, but I notice an error in the results. The navigator of the fourth-placed was not Col Young (who was forced to withdraw just before the start) but Geoff Jones who joined at a moment's notice. Ross and I didn't meet Geoff (who was a heroic stand-in) until the evening prior to the start. Cheers Peter and it's good to know that people such as yourself have found the site! I'm not sure where I picked up Col's name but it seems to have pervaded my history, but I've fixed (hopefully) all occurrence now. I wasn't alive in 1979, but have been told by a number of drivers in the event that Brock used 3 (or maybe 4) cars to win. Its a widely told 'story' so I'm surprised there's no mention of it here (or that I saw). Interesting comment Rob but given the nature of the event, changing cars would have been an impossibility. Certainly every time I saw the Brock car (and all the others), it was the same car. This story is an urban myth. Certainly lots of parts were changed - mostly suspension, diffs etc. Frankly, there would have been no advantage in changing cars when the main "wearing" parts could be changed so quickly. Cheers to everyone that made this website possible. It was such a thrill to watch the footage after so many years. I helped Larry Perkins back in ‘79 to build his Beetle and was happy to see the footage. I have a special connection to that time because I was on the committee of the Light Car Club of Australia and stayed in Melbourne the whole time during the race.